Leonard P. Thielen, 91, Detroit Lakes, MN, formerly of Callaway, MN, died Thursday, September 13, 2018 at Oak Crossing. 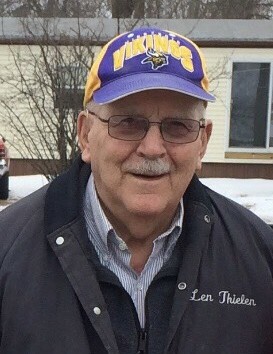 Leonard Peter Thielen was born August 16, 1927 in rural Callaway, MN to Adam and Mary (Ley) Thielen. He was raised in rural Callaway and educated at the Buffalo Lake school. Following his schooling, he farmed with his Dad. Leonard was united in marriage to Estella Metzger, October 14, 1952 at St. Benedict’s Mission in White Earth, MN. They farmed until 1955 when Leonard began operating the Thielen Skelly gas station in Callaway. He operated the station until being appointed Postmaster in Callaway in 1968. He served as Callaway Postmaster 1968 – 1989. Leonard joined the Callaway Fire Department in 1955 and served as Chief for 12 years and retired after serving the department for 31 years. He was a charter member of the Catholic Aid Association, serving as President for a number of years. He was a member of Holy Rosary Council, Knights of Columbus and served as Grand Knight in 1974-1975. He also served as the Minnesota State Membership Chairmen for 4 years. District Deputy for 1 year and was a member of the Northland Degree Team for 17 years. He joined the Knights of Columbus 4th Degree in 1983. Leonard and Estella built a year-round home on Floyd Lake in 1991. After moving to Detroit Lakes, Leonard did volunteer work at St. Mary’s Hospital and Nursing Home, drove the St. Mary’s bus for Winchester and Lincoln Park. He and Estella also spent winters in California. He entered Oak Crossing, June 28, 2017. Survivors include his wife of 65 years, Estella of Detroit Lakes, sons: Peter (Jayne) of Detroit Lakes, Michael (Sara) of Detroit Lakes, Patrick (Jane) of North Oaks, MN, Kurt (Winny) of Maple Grove, MN, Craig (Kathy) of Corcoran, MN; daughters: Sharon (David) Siekas of Brainerd, MN, Marcia (John) Baumgartner of Wheaton, IL, Brenda (Kevin) Willard of Wyoming, MN, Mary (Brad) VonRuden of Rochert, MN, 28 Grandchildren and 29 great-grandchildren. He was preceded in death by a son, Daniel, seven brothers and sisters, Genevieve, Eleanor, Melba, Margaret, Norbert, Jerome and Ralph.